Liverpool-born author Tony Barrow worked beside The Beatles as the world-famous group's own public relations man through each exciting phase of their dazzling career in the sixties. 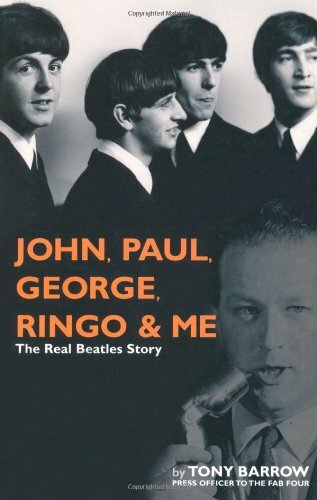 His up-close-and-personal profiles of John, Paul, George, and Ringo probe their true personalities and reveal their amazing lifestyles as no other book has doneBarrow gives a devastatingly honest, powerfully authoritative, and absolutely credible eyewitness account of how his history-making clients acted in and out of the spotlight. Also published here for the first time is his astonishing collection of photographs, including candid snapshots taken in the sanctuary of dressing rooms and hotel suites from where press and paparazzi were excluded.Barrow watched the Beatles' "greatest gig of all" at New York's Shea Stadium and, at Paul's request, he made a personal souvenir recording of The Beatles' final concert at San Francisco's Candlestick Park.The author lets his quirky Liverpudlian sense of humor run all through the text because "rock 'n' roll was never invented to be taken too seriously."